$750k has been allocated by the state government to upgrade the foreshore. 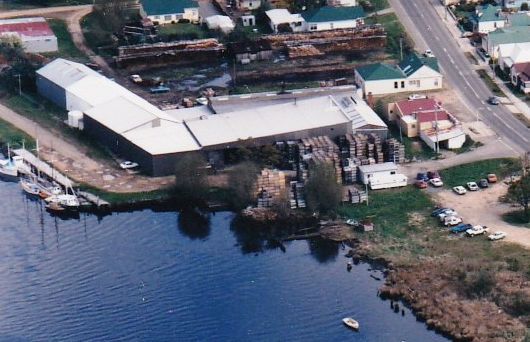 This project is to be administered by the Huon Valley Council. The council organised an initial planning meeting on Monday 17th September, which was attended by David Pittaway and Richard Forster from the LBT. Here are their short notes, highlighting the implications for the LBT. The proposal is to concentrate on hardening the foreshore outside the evaporator sheds, providing wharves for both large and small boats. These are to be used both by visitors to Franklin and locals needing somewhere to temporarily tie up. See diagram below. This proposal is largely a re-establishment of the wharf that was on this bank of the river up until the late 1990’s. See the picture taken in 1995 below. The piles which secure the riverbank are disintegrating, and some of this grant will almost certainly have to go into stabilising this bank. The ‘Inspiring Places’ concept plan and the summary from the community consultation conducted by the Franklin Progress Association in November 2017 will be used as initial input. 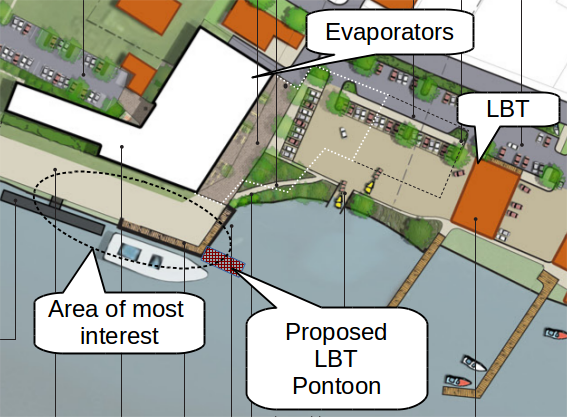 The LBT plans to deploy a pontoon in the middle of this development area (see diagram) . This would seem to be complementary to the development. Whilst it may cause a delay, there are advantages to merging these two initiatives, but also risks attached to doing so. The LBT committee will communicate with the council about this.